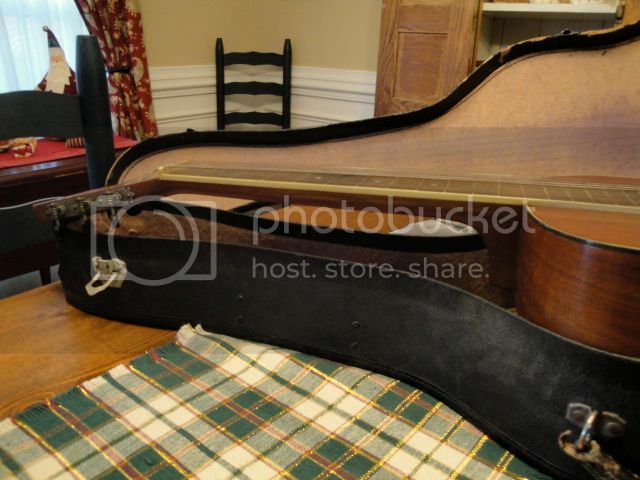 I have my Grandmothers Washburn 5240 acoustic guitar and the original case. 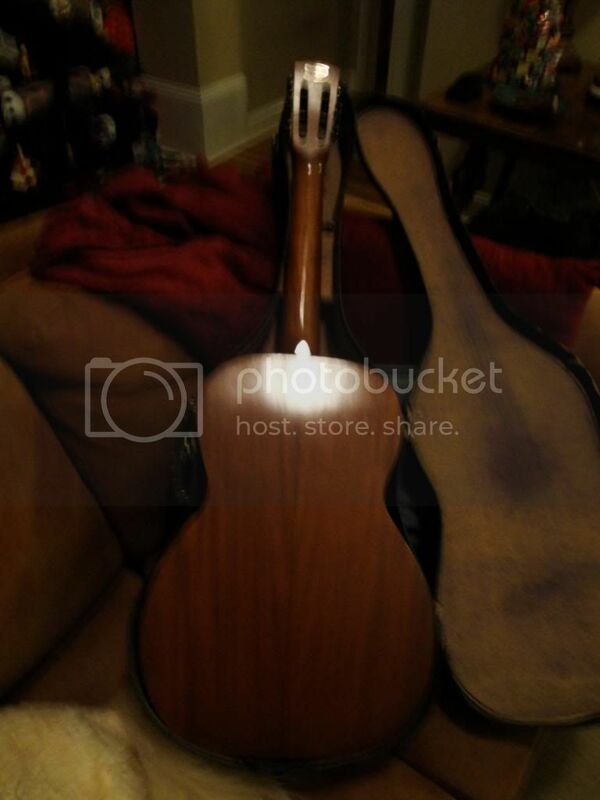 The guitar is in excellent condition. It is stamped 5240 inside the body at the base of the neck and has serial #1571 stamped into the back of the head below an oval brass medallion. She said she purchased it as a teenager in Chicago. My research indicates it was made between 1930 and 1934 (which would have made her 20 - 24). 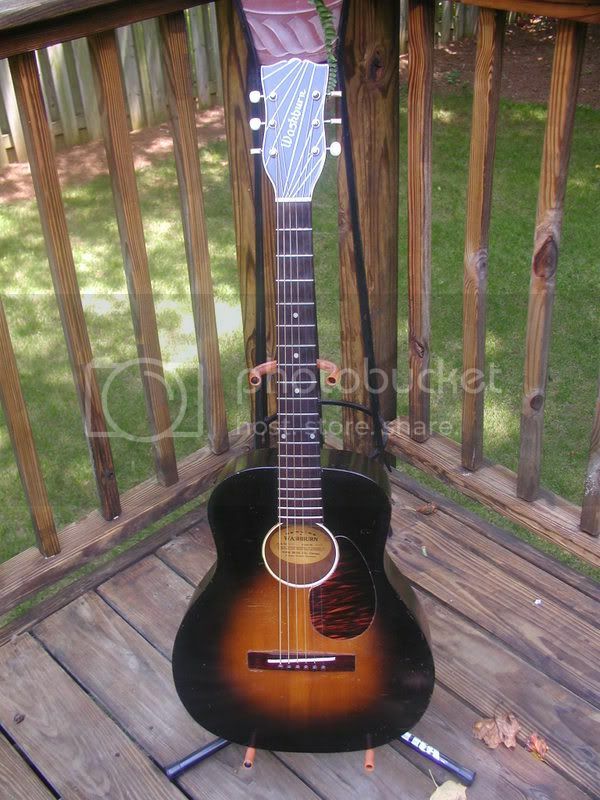 I plan on giving it to my daughter and would like to have some background and a value of the guitar. Any help would be appreciated. 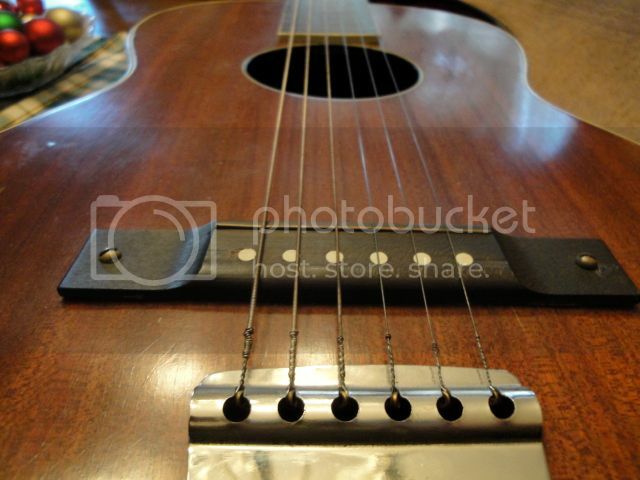 Why does it have bridge pins, and a rtapeze tailpiece? Also, there is no label in the body and no markings other than the 5240 stamped in ink inside the body, the 1571 punched into the head, and the brass medallion on the head. I have no idea. My grandmother's memory isn't that good (she's 102). All I know is she bought it new and has owned it ever since. Are those bridge pins, that pull out, or just dots? Tom. It looks like it is in very nice condition! 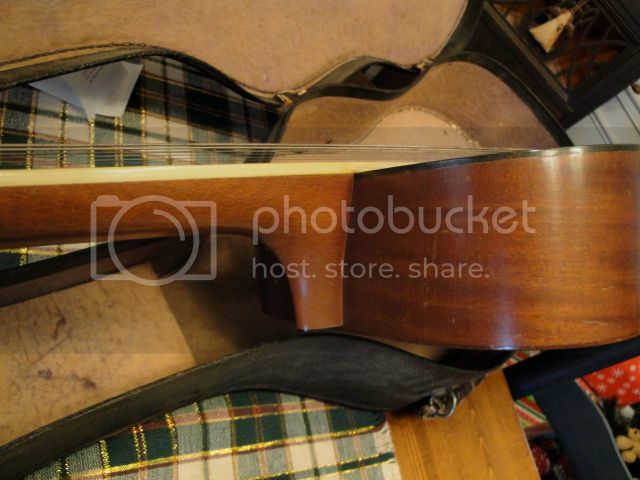 To be honest I am not sure what it is you have, that bridge is wrong for the date and the tailpiece shouldn't be there. 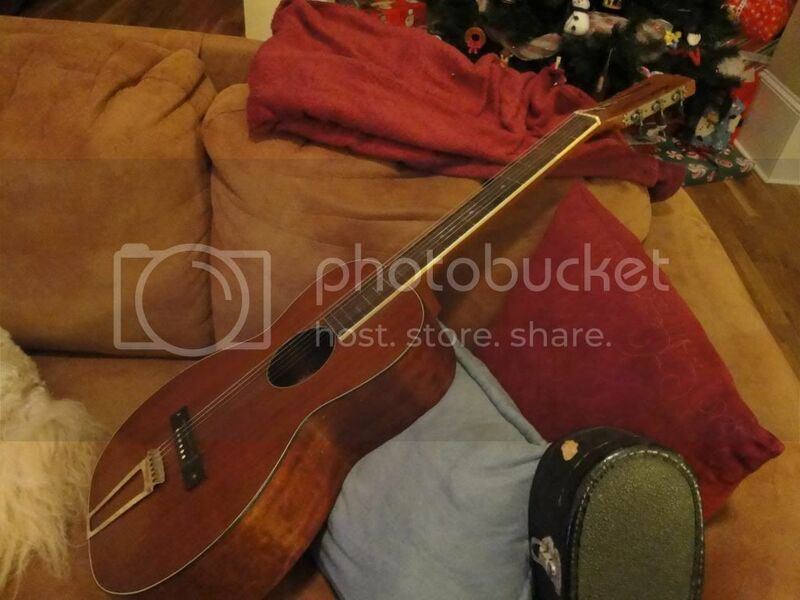 The link I provided for you will show you what a 5240 looks like and the guitar was made by Tonk Brothers and not Lyon and Healy ( EARLIER MODEL )and the center strip should have a branding saying the following " genuine Washburn Tonk Bros.Co.Chicago and they also had a smile bridge. 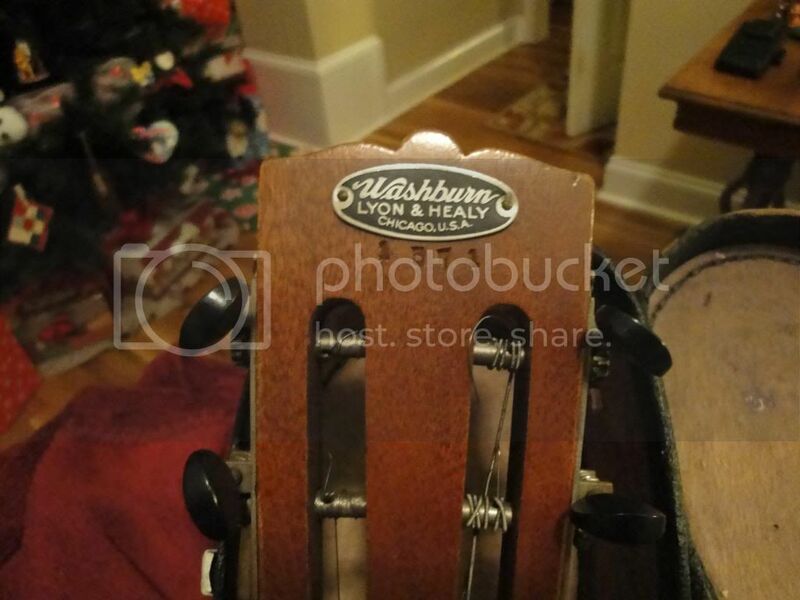 You are correct - Lyon & Healy changed model designations for Washburn guitars to start with 52 (i.e. 5200, 5202, 5203) in the mid 20's so yours could have been made from about 1925 to 1928. Tonk Bros took over the Washburn line from Lyon & Healy in 1928. You guys are great! The 1925 - 28 dates make sense with Grandmother buying it as a teenager (she would have been 15 - 18). I have included some better pictures including the "5240" stamp in the body. Oops.... forgot to load the photo showing the "5240" stamp. Wow, even the case is still in nice shape. Tom. Thanks for the pics. The bridge and tailpiece are definitely not original. The dots in the bridge are covering the bridge pin holes. 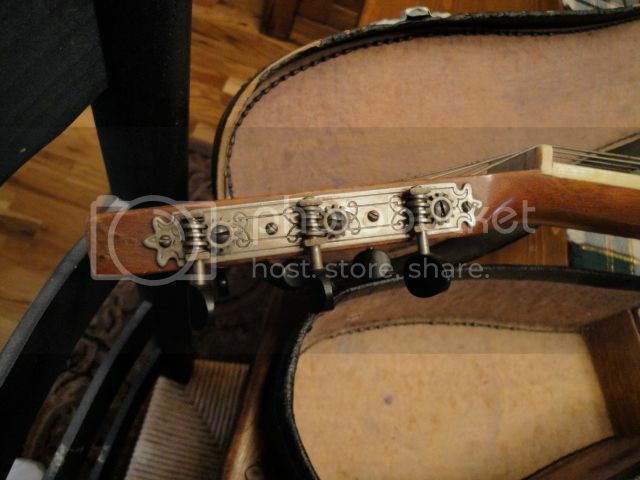 Tailpiece was added later. Still a very nice piece. 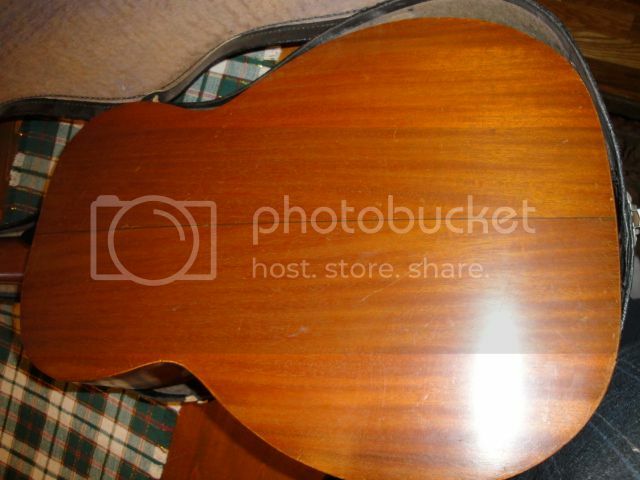 Since she has some sentimental value I'd find a local luthier who can do the restoration work and get her back into original shape. Very cool and rarely seen model from the Lyon & Healy era and likely Stewart & Stewart made. 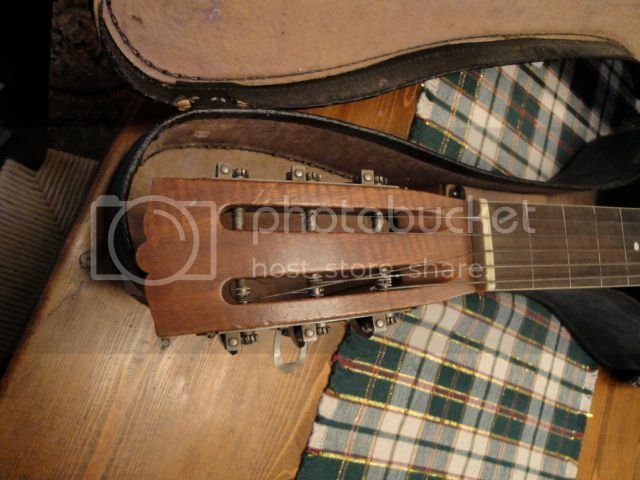 A few years back, I was discussing a few little known Washburn guitar models with Hubert Pleijsier, author of the book on vintage Washburn instruments, and he told me that there were apparently at least three Hawaiian models introduced perhaps as late as 1929-1930 during the big Hawaiian music craze. Most had snowflake inlays on the fretboard and the few that have been seen were labeled as Styles 5242, 5244 and 5246. This was before the change in model designations from 525X to the 524X series for all guitars that happened in 1937 so most guitars in that era were not 524Xâ€™s. 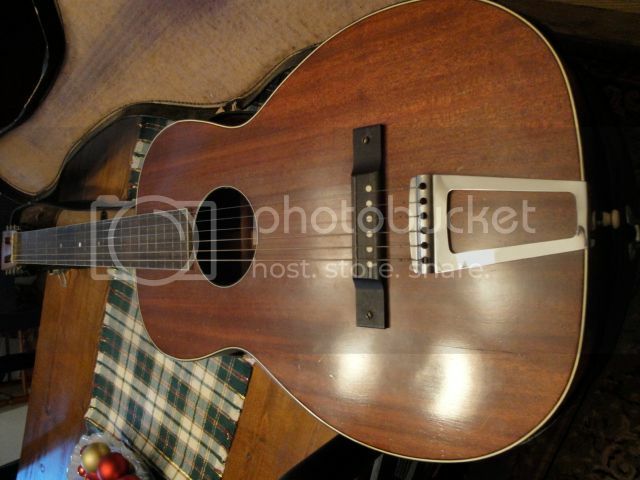 This seems to be of the same type and era (and fits with the model chages to 52_ _ model numbers in teh mid 20's) so there must have been a model 5240 Hawaiian issued as well and this guitar would be an example of it. These Hawaiian models may not have been officially released as they do not seem to show up in the regular catalogs for that time era, but seemed to have left the factory up to the 1930s - some in the Tonk Bros era but after the Stewart & Stewart time â€“ although they were most likely made in the mid 20's by Stewart in the Lyon & Healy era as indicated by the metal label. 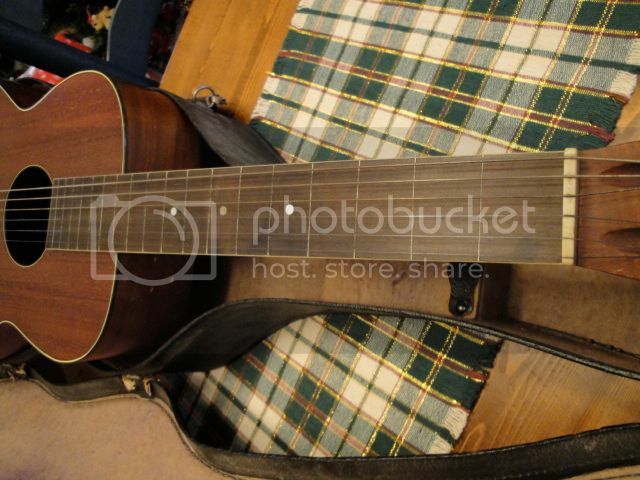 This one is a very cool guitar with a great story having been in the family so long. 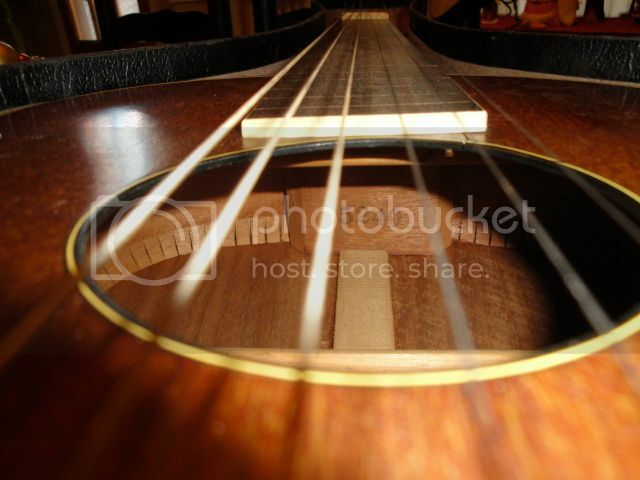 It is clearly is a Hawaiian style guitar with the high nut and the very small frets â€“ it also clearly has a non-original trapeze bridge as well as a replaced non-original style pin bridge â€“ and it has a mahogany or koa top, rather than the much more commonly found spruce top. 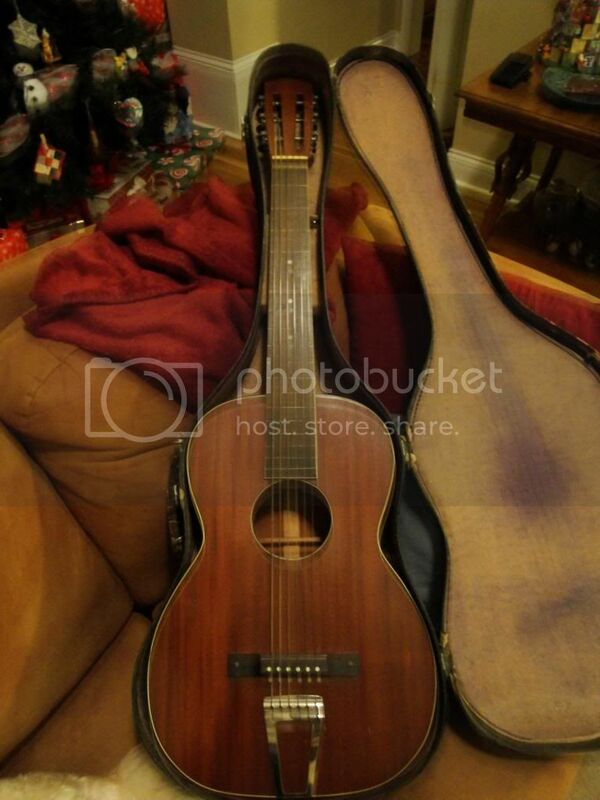 The more commonly seen Washburn Model 5240 was not a Hawaiian model but was the one with the larger lower bout and very small upper bout - an example of that later model from the mid to late 1930's is pictured below. Another thing worth noting is the saddle is not angled properly. So... the intonation will always be off kilter a bit unless playing slide/Hawaiian style.